Phở ga is perfect for cold winter days. Can I just say how much I love phở (pronounced like “fuh”) ga in winter? It’s basically Vietnamese chicken noodle soup, with all kinds of good stuff added. 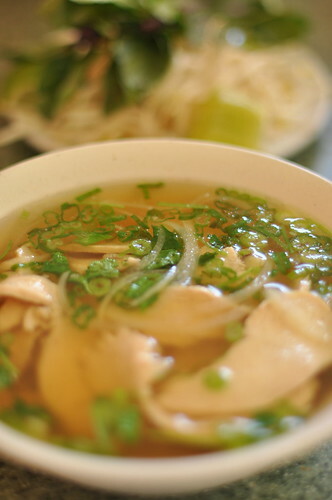 Slices of chicken, green onions and rice noodles all cooked in a delicious broth, onto which you can toss Thai basil, lime juice and bean sprouts. You can also add hot peppers and hot sauce if you’re so inclined. I’m not. I’m not usually great with chopsticks, but I can handle this for some reason. The noodles are really long, so there’s no graceful way to eat this, but everyone else is in the same boat. We’re lucky to have two really good phở places near us, so I don’t make it at home very often. If you’d like a decent recipe, here’s the one I use. I keep forgetting to ask the restaurant owners where they get their fresh Thai basil. They either grow it in a greenhouse or have it flown in from warmer climes. I can grow it in the summer, but who wants hot chicken soup when it’s 95º outside? I wouldn’t recommend using regular basil. The Thai version has a unique, sweet anise-y flavor that really adds to the soup. It’s not essential, so don’t worry if you can’t find any. 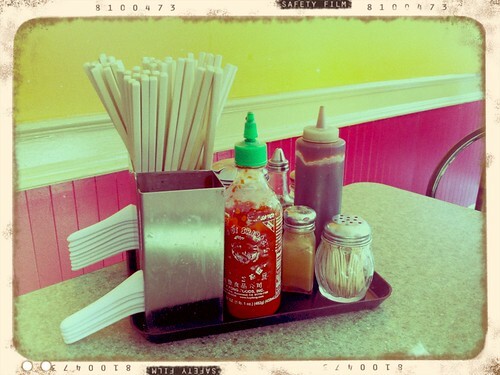 This entry was posted in food, photography and tagged chopsticks, condiments, neon sign, Phở ga, spoons, Thai basil, Vietnamese chicken soup. Bookmark the permalink. 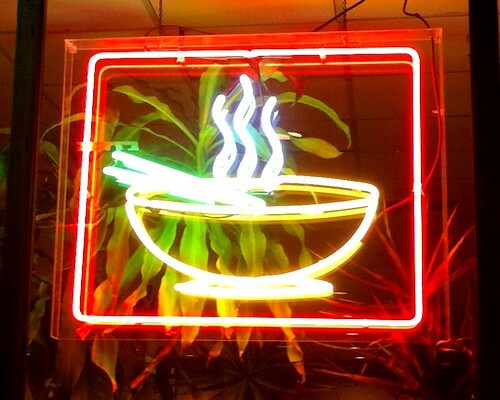 14 Responses to Phở ga is perfect for cold winter days. Thanks for stopping by, Janine! That makes me quite sentimental… I used to eat this in Paris regularly. I can’t find it here at all but I did it once myself. We have some great China stores who sell the fresh Thai basil. You are totally right, it has nothing to do with the basil we know from Italian cuisine. Will have to test your recipe soon. In Paris! I didn’t even know what pho was when I was there. I need to find an Asian grocery here. I love Pho Ga. I make my own vegetarian version, which I made for dinner last night in fact! Cool! Do you use tofu? Thanks so much for stopping by. I think your blog is wonderful. Actually, I don’t like tofu. I just use a mixture of vegetables. Love pho ga! It’s the only pho I get. Seattle, especially my new neighborhood, is practically swimming in it. Rich, I was just thinking it would be nice to hear from you! Sending you an email…. When I used to live in Taiwan, we used to eat soup like this, dragging the noodles with chopsticks into the spoon. But it was still messy and I ruined many shirts. I think this was the first time I didn’t get a splatter on my shirt. One of my favourite dishes that I’ve been enjoying for years. Next time, finish it off with a cup of Vietnamese style coffee. You should be asked if you want it cold or hot. Most Vietnamese drink it cold – true to Canadian lifestyle, I prefer it hot! I love Thai iced tea and coffee, but never tried Vietnamese coffee. As I type wearing my down vest and fingerless gloves, I’m craving a nice hot cafe mocha.